In Altoona, Pennsylvania, those who face the consequences of an accident or injury caused by another come to the law office of Goldstein Heslop Steele Clapper Oswalt & Smith for representation. With cost-effective solutions, compassion and the zeal to get our clients the compensation they deserve for their injuries, we are proud of our legacy of excellence. For over 100 years, our law office has represented those in the Altoona, State College and Johnstown metropolitan areas. This includes Blair, Cambria, Bedford, Huntington, Centre, Clearfield, Fulton, Somerset, Westmoreland and Indiana counties. Those who have suffered injuries related to car, truck, motorcycle, bicycle and pedestrian accidents are welcome to visit us for a free initial consultation to discuss their case. 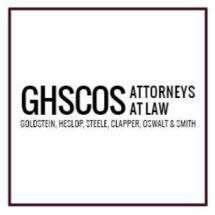 The qualified attorneys at the law office of Goldstein Heslop Steele Clapper Oswalt & Smith also handle personal injury cases involving attractive nuisance, wrongful death, workers' compensation, defective products, construction accidents and premises liability. We live and work within the same community our clients do and give the same dedication to every case regardless of the size. As we are genuinely concerned for our clients, we do our best to be accessible whenever we are needed. To provide greater flexibility for those who need legal representation to help them through a difficult time in their lives, we accept credit card payments at our office. Our attorneys are also experienced in matters of municipal law, corporate and business law, Social Security Disability, civil litigation, estate litigation, probate, estate planning, property litigation, real estate and insurance disputes.